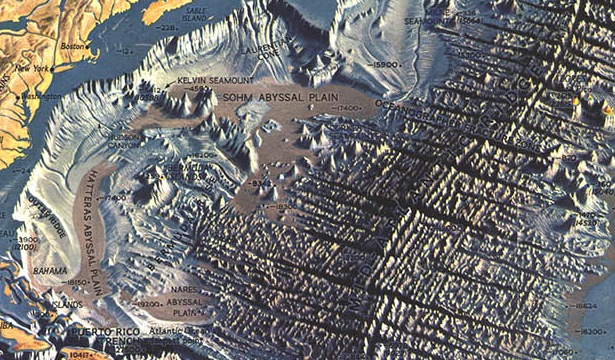 In 1967, Austrian landscape panoramist and cartographer Heinrich Berann painted the first in a series of plan oblique physiographic maps of the ocean floor which ultimately culminated in the 1977 World Ocean Floor map for Columbia University and the U.S. Navy. He worked in collaboration with pioneering oceanographers Bruce Heezen and his assistant Mary Tharp and together they revolutionized the theories of plate tectonics and continental drift. 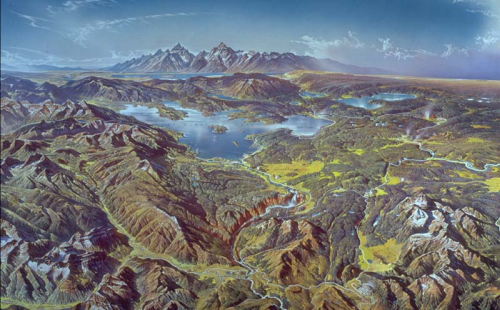 The individual maps were printed by National Geographic (this from 1968) and labels added using the familiar yet unobtrusive NatGeo typeface. Berann skillfully combined blue-greys to create a topologicallly accurate, though hugely exaggerated, picture of the ocean floor that leads readers to want to explore. 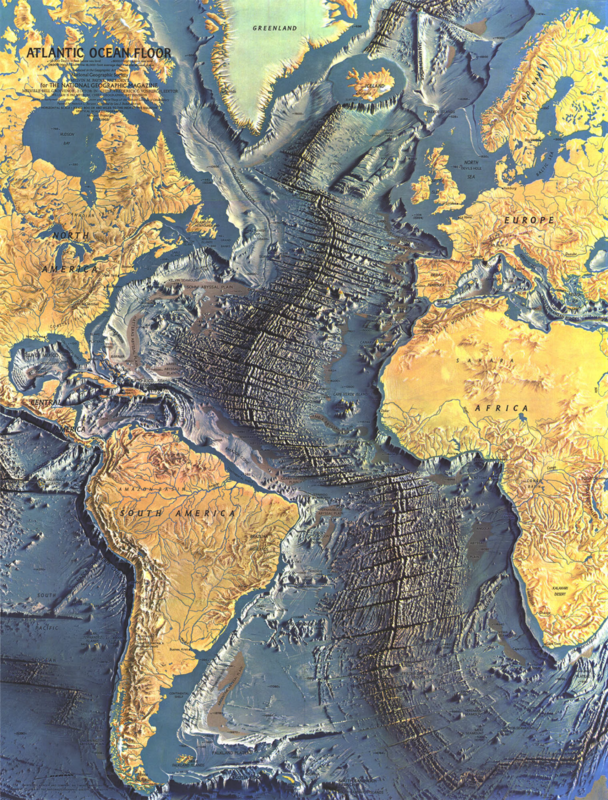 The Mid-Atlantic Ridge and fracture zones appear so life-like with a rippling effect and intricate detail that it draws your eye in and captures your attention. This creates a strong figural component positioned central to the map page that suggests the page (and fracture zone itself) splitting down the middle. The yellow land and deep grey-blue ocean floor provides a strong contrast between land, shoreline and oceans. This map is also testament to the outcome of strong collaborations. Berann knew little of the sea floor topography but worked alongside domain experts whose knowledge was key to the end product. 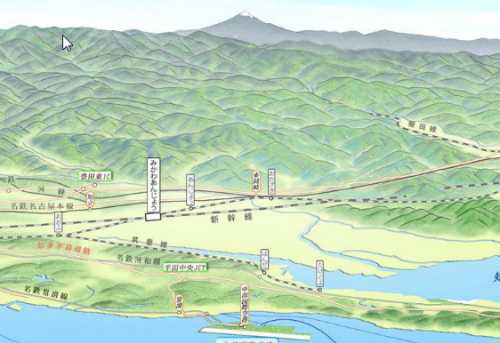 This is a lesson for all map-makers in that their designs should be based on sound data, detail and judgement. Cartographers are good at cartography. More often than not bringing in expertise gives the work authority. Of course, the counter is also true and many domain experts could use a good cartographer. More of Berann’s work can be seen at his web site here. Click here to view an online zoomable version. A large format poster provides the media for this map proving that size sometimes does matter in cartography. Sure, this could be presented on the web but the impact would not be as impressive. Sometimes a map deserves space and to be seen in its entirity at once (the irony here being we’re referencing an online version!). 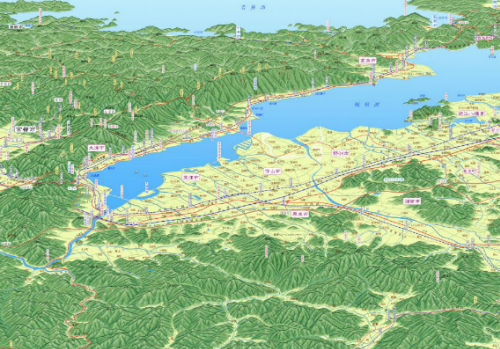 Geographx have become masters at creating 3D maps based on plan oblique and orthographic oblique projections that create a pleasing end product free from some of the distortions the more usual perspective view creates. The techniques create parallel projection lines and places the viewpoint at infinity. Crucially, they allow features in the landscape to remain figural and work particularly well in mountainous regions. 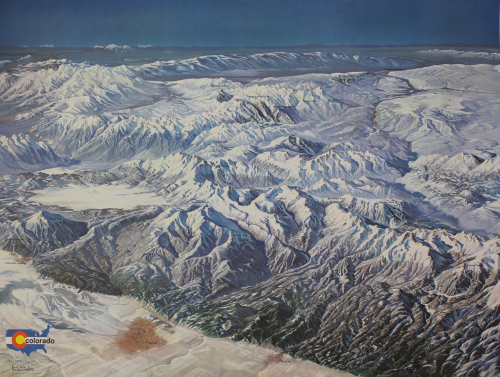 Additionally, the photo-realistic textures and colours used give us a sense of place and the natural beauty of the landscape which is used to great effect here to highlight the snow covered slopes of Mounts Ruapehu, Tongariro and Ngauruhoe. 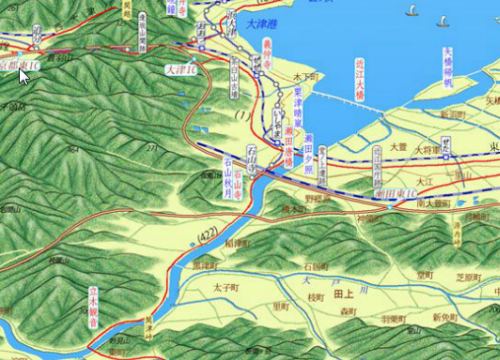 The addition of more traditional topographic content (vector lines, point symbols and labels) allows it to go beyond merely the artistic and also serve well as a reference map.